When Mom (or Dad) is away, the kids will... starve?! 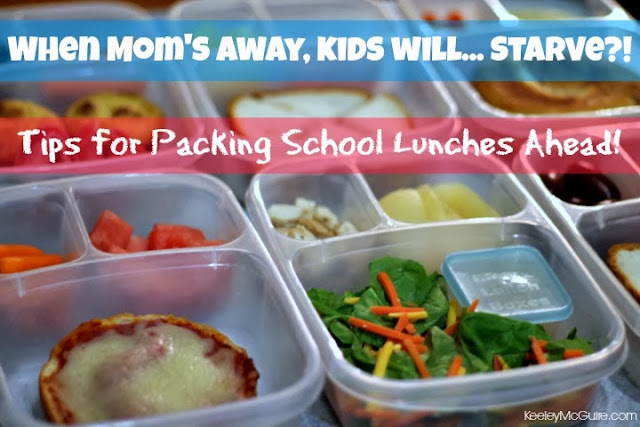 For parents of children with food allergies or on special diets, if we're out of town for business (or pleasure) we don't have the luxury of falling back on school cafeteria foods to feed the kiddos while we're gone. Instead, we must plan ahead and stock up the fridge and freezer with allergy friendly foods. I'm going to be gone over the next week and Little Miss will have family staying at the house with her so she doesn't miss school. (God bless them!) It's something we've done before and I know the better prepared I am in getting as much ready for her as possible, the smoother it is for all parties involved while I'm away. 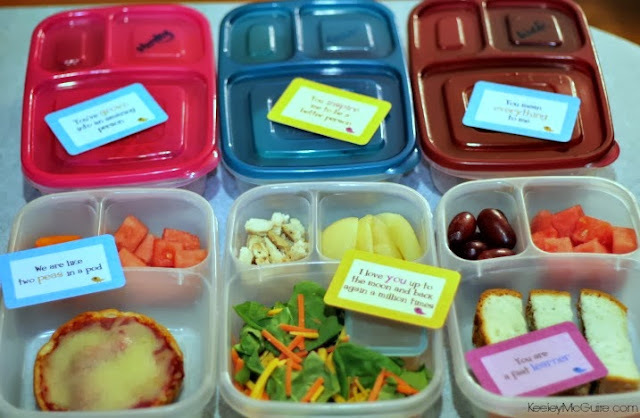 Being that I've had to pack lunches ahead for Little Miss before, I have a pretty good idea of what works for her based on the foods she prefers and what will be easiest for her grandmother to grab in the morning for her. Why pack ahead? Well, I want to make sure that 1) her foods are "Little Miss safe", 2) that she's getting a balanced meal, and 3) mornings are tricky enough when it's not your normal routine, so I don't want to burden her family with another task. The hope is that by helping them out this way, lunches won't be second fiddle or make them miss the bus trying to put together quickly. Having a plan is key. If you often find yourself struggling to figure out ONE day, let alone six (in my case), I highly suggest MOMables. 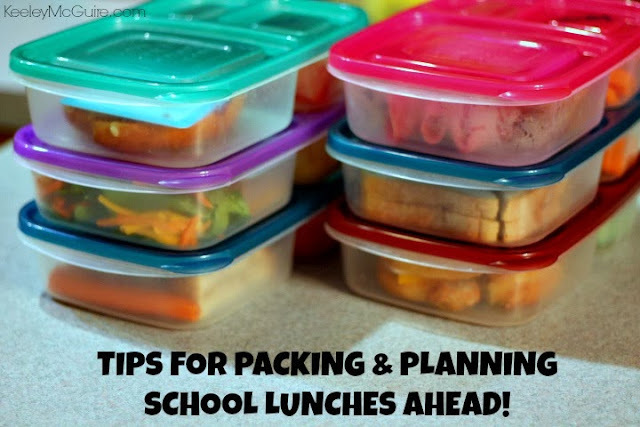 The site is packed full of plan ahead lunch menus and tips to make your life less hectic! 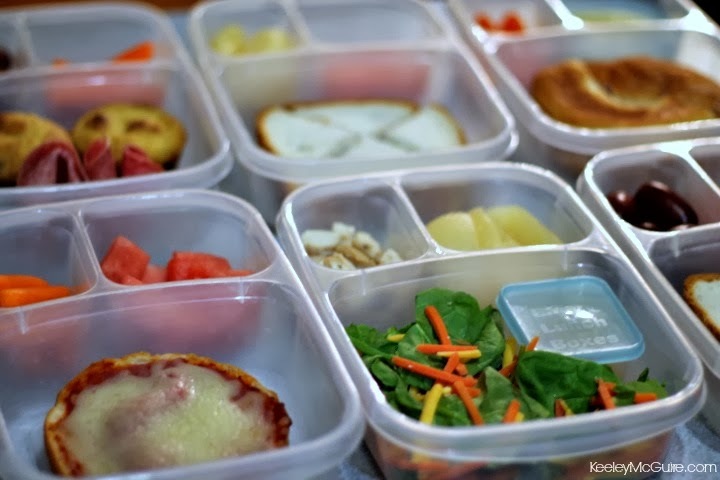 I knew what I wanted to pack so by lining up our EasyLunchboxes in rows by day, I could easily fill each box with what she needed and in order. Why was this important to have them in rows by day? Some foods I know will keep longer/ fresher than others. I didn't want her to have the same sandwich every day, though I know they'll last the longest, so I packed foods that might only keep a couple days to eat first. It's important to also think about the fruits and vegetables your child likes most. I know that when she's with grandma, getting her normal amounts, or even eating the leftovers after school, won't happen (like grandma is going to "force her" to eat that side of broccoli at supper... pushover! lol). That being said, I wanted to include the items that I knew she would be sure to eat and would also be sure to last the full week. I know that the watermelon will only keep for a few days, so I only packed it in two of the first three lunch boxes. 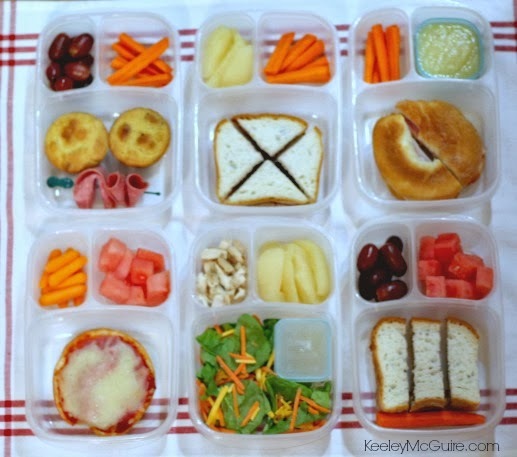 Items like grapes and applesauce will keep much longer so those were planned in later lunches. One item I did compromise on for the week were her pears. Child LOVES pears! But keeping fresh ones good all week was not going to happen. We used jarred ones instead, that way I knew they'd last while I was away. Click here to see MOMables tricks for making fresh berries last! I also know that my freshly cut carrot sticks will keep longer than the bagged baby carrots from the store. Those tend to get wet and slimy, yuck! So we only packed those on day 1. The other lunches have fresh cut carrots (with the exception of day 2's salad) because it's not only a veggie I *know* she'll eat, because she loves them, but they will keep nicely. Photo taken in the wee morning dark hours this morning! What'd we pack? Keep in mind, I actually store Little Miss' gluten free & allergy friendly bread in the refrigerator during the week anyways, so I knew that packing her sandwiches ahead would not be an issue for causing either sogginess or dryness. Our lunches start at the bottom left on the above photo and go counterclockwise by day. Day 1 (Wednesday): Udi's GF Pizza Bagel (that she can reheat at school or eat at room temp. ), baby carrots, and watermelon. Day 2 (Thursday): Spinach salad topped with cheese, matchstick carrots, and a Mini Dipper with dressing. She also had diced up cooked chicken breast for eating or topping on her salad and pear slices. Day 3 (Friday): SunButter & Honey sandwich sticks on Udi's GF bread, a large carrot, grapes, and watermelon. Day 4 (Monday): Two Chocolate Chunk Pancake Muffins, skewer of salami slices, fresh cut carrot sticks, and grapes. Day 5 (Tuesday): SunButter & grape jelly sandwich on Udi's GF bread, fresh cut carrot sticks, and pear slices. Day 6 (Wednesday): Udi's GF Bagel sandwich, fresh cut carrot sticks, and applesauce (lid not pictured for blue container). To let Little Miss know that I was thinking of her each and every day, I also stuck a Lunchbox Love Note in each lunch box so she could find a sweet note picked out from her Mama every school day I'm gone. It's the little touches that mean a lot! You may also notice the writing on her EasyLunchboxes lids. Using a dry erase maker (it washes off), I wrote the day of the week on the lid. Even though they'll be stacked in the fridge in order, it's another reminder so they know which to grab which day and to keep it easy. Little Miss also has to bring a school snack for class each day and I know she'll want one after school, as well. To keep this easy and safe, I planned ahead for this too. In a small box on our counter top, I filled it with shelf-staple safe items they could easily grab and go! There's also a big bowl of fresh fruits, like apples and bananas. I also made sure the fridge and freezer had her favorite cheese sticks and yogurt stocked up so she could enjoy them at school or home for snack, or the yogurt even at breakfast time. Speaking of breakfast -- Besides the yogurt, I made sure the house was stocked with her favorite GF & allergy friendly cereals, homemade GF poptarts, breakfast cookies, and premade chocolate chip pancake muffins or waffles in the freezer. With a little planning and thought, you can easily prep ahead lunches and snacks for your kids while you're away! Oh WOW Keeley!! Many thanks for this super informative and helpful post and the FAB pics of all the lunches! LOVE! Yet again, this ought to be required reading for lunch-packing parents. 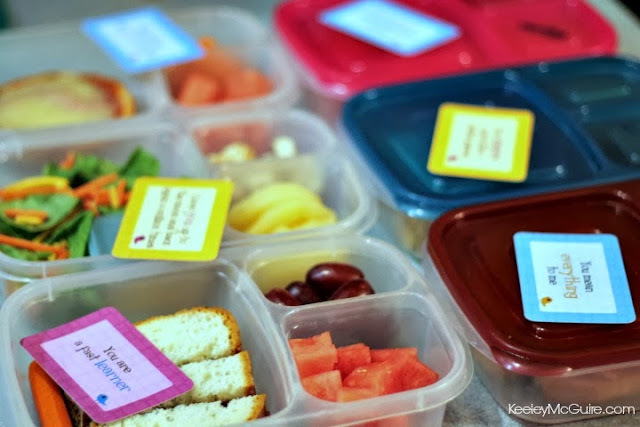 Of course I appreciate the SunButter inclusions since I blog for them, but as one of "those" lunch-packing moms, thanks for the great ideas, since mine are waning (and I need to be out of town in a few weeks). Thank you thank you I'll use this plan for me during my busy weeks at work. You're an awesome mom! I love this post, it is so helpful. 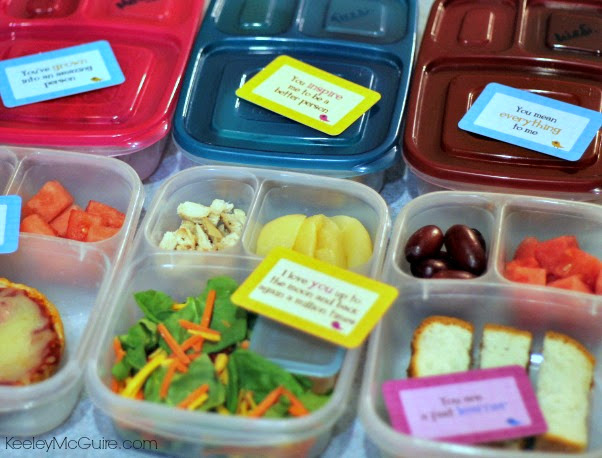 I often struggle with how to plan ahead for lunches, and this post is full of truly helpful ideas. Oh, and chocolate chunk pancake muffins?! Need that recipe asap.